Nothing beats Living On Campus — you’re next door to everything & everyone. Roll out of bed. Walk to class. Lunch with friends. Quick nap. Afternoon lecture. Sunset surfing at the beach. Study session with suitemates. Gym for a workout. Movie night in the lounge. Most students choose to live in the residence halls their first year; many return for subsequent years. Research shows that students who live on campus get more out of their college experience. Residents enjoy resources designed to make their transition into college smooth. They also meet people from all walks of life. First-year students live in the Marshall residence halls. Single, double, and triple rooms are arranged in suites. Each suite has a bathroom, living area, and patio/balcony. Some first years are assigned in our apartment community, pending space. Second year (and above) students live in the Marshall Apartments. Upper apartments are located next to Marshall field. The Lower apartments are in the eucalyptus grove. All apartments are fully furnished and have a kitchen, bathroom, living room, and 3 bedrooms (singles or doubles). Here are some sample buildng layouts and floor plans and see below menu for more details about each community! For information on incoming first year housing visit the Housing/Dining/Hospitality website. All beds in both residential halls and apartments are extra long twins (36" x 80"). Renovated (Summer 2012) with new carpet, blinds, paint and furniture! O, P, Q, R, U, V buildings with room numbers ending in 02, 05, 08, & 11 are 10'10" x 9'4"
O, P, Q, R, U, V buildings with room numbers ending in 03, 04, 09, 10 are 10'6" x 9'5"
N, S, & T buildings with room numbers ending in 02 & 05 are 10'8" x 9'9"
N, S, & T buildings with room numbers ending in 03 & 04 are 9' 10" x 10' 10"
Closets are approximately 6 square feet, ceilings are 8'9" tall, and beds are between 13 and 23 inches off of the ground. O, P, Q, R, U, & V buildings are 12'2" x 13'6"
N, S, & T buildings are 15' x 10'3"
The permanent closets are at least 6 square feet, ceilings are 8'9" tall, and bunk beds are between 13 and 23 inches off of the ground. The lofted bed in triple rooms are 6' off the ground. The two drawer dresser in the closet under the lofted bed is 18" wide, 22" deep, & 21" tall. Six buildings titled G, H, J, K, L, & M.
Single-story:One double room, one triple room, one single room, a kitchen, closet, bathroom, and balcony. Each apartment has a sink, stove, oven, full refrigerator, kitchen table, four chairs, 3 seats, a couch, 2 lamps, and 3 coffee tables. Each resident has a single bed, a dresser, a desk, a bookcase, and a closet. Each of the apartments is wired for telephone and internet service. Mailboxes are located on the side of Fireside Lounge in the Lower apartment area. All ceilings are 8 feet tall. Six buildings titled A, B, C, D, E, & F.
Double-story: One double room, two single rooms, a kitchen, closet, bathroom, and balcony. Single-story: one double room, a kitchen, bathroom, and balcony. Each apartment has a sink, stove, oven, full refrigerator, kitchen table, four chairs, 1 seat, a couch, a lamp, and two coffee tables. Each resident has a single bed, a dresser, a desk, a bookcase, and a closet. Each apartment is wired for telephone and internet service. Fireside Lounge, laundry facilities, a basketball half-court, parking, and the mail room. Living room: 11' 1" by 13' 7"
Single rooms: 9' 4.5" by 12' 2.5"
Double rooms: 11' 11.5" by 15' 3"
Our Houses are split into three different sections: Residential Halls, Lower Apartments & Uppers Apartments. Each house is also assigned a different theme. 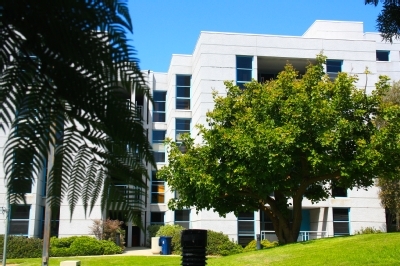 Gender Inclusive Housing is available for continuing residents in all seven apartment living areas at UC San Diego. This housing option is available only to residents from the same college, the Village or I-house. Gender Inclusive housing allows continuing residents of all gender identities to live together in apartments. Applications for the 2016-2017 were completed in March 2016.